Audrey. Jackie. Grace. There are very few style icons of the 20th century we can recognize by just their first names. Grace Kelly, also known as Princess Grace of Monaco, still influences a legion of women, both young and young-at-heart with her iconic style. Want to see the how the real deal Grace became such a prolific legend? You’re in luck on your next trip to London this year. Some of the magnificent wardrobe that Grace Kelly acquired will be on display at London’s Victoria & Albert museum this year in the exhibit aptly named “Grace Kelly: Style Icon”. The exceptional presentation will offer an insider’s look glimpse into the glamorous life of one of Hollywood’s meteoric stars of the 1950s before she became Princess Grace of Monaco. You’ll see creations from many of Kelly’s films, including “High Society” and “Rear Window”; as well as the gown she wore accepting her ‘Best Actress’ Oscar in 1955, for “The Country Girl”. Also in the show is the ensemble she wore for her first meeting with Prince Rainier of Monaco (which she had to make due with since she had a wardrobe malfunction at the last minute in her originally planned outfit). It’s really the only thing od the collection that looks dated – it’s a dark day dress with a large floral motif that hasn’t held up very well in the style calendar. Then there are her haute couture wardrobe (truly fit for a princess) from the 1960s and 1970s by her favorite Paris couturiers, of which she was a terrific and consistent customer, including household names like Christian Dior, Cristobal Balenciaga, Hubert de Givenchy and Yves Saint Laurent. The exhibit is a smart one, arranged in three sections, that tracks her rise from MGM and Paramount to her own fairytale life as the Princess of Monaco. Of note in the first section are three costumes designed by MGM’s studio designer Helen Rose, for Grace Kelly’s star turn in “High Society”, in 1956, including the Grecian-style bathing robe, an embroidered evening gown, and a black chiffon dress, designed by Paramount’s infamous costume designer, Edith Head, for the Alfred Hitchcock classic, “Rear Window”. 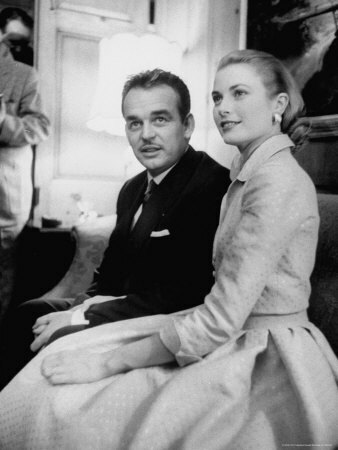 A second section focuses on the dress Kelly donned for the announcement of her engagement to Prince Rainier, as well as the clothes designed for her trousseau and internationally acclaimed wedding in 1956. The third section exemplifies the Princesses’ pace-setting style as a fashionably grand cultural ambassador of the tiny Monaco, and contains a plethora of the many couture gowns created for official royal engagements, such as the long sleeve purple chiffon Yves St. Laurent, worn in 1981, to a Royal Opera House gala in London, where Princess Grace met the then Lady Diana Spencer and Prince Charles. The show covers the 1950’s through the 1980’s, when Princess Grace was killed in an automobile accident in 1982, spanning the very best of the era’s high fashion across four decades, and includes eight dresses by Christian Dior, an extravagantly beaded Balenciaga jacket, YSL’s ‘Mondrian’ dress from 1965, Coco Chanel suits jewelry by Van Cleef & Arpels, and, of course, the ubiquitous original Hermès ‘Kelly’ bag. To add more of a Kelly touch, you’ll be able to view archival film and video footage, film posters, family photographs, film clips and magazines to learn about the woman who would become everyone’s princess.